The Pieps Vector was discontinued in 10/2013. The Pieps Vector was recalled in the Fall of 2013. "Please stop using the Pieps Vector immediately." Read the details. 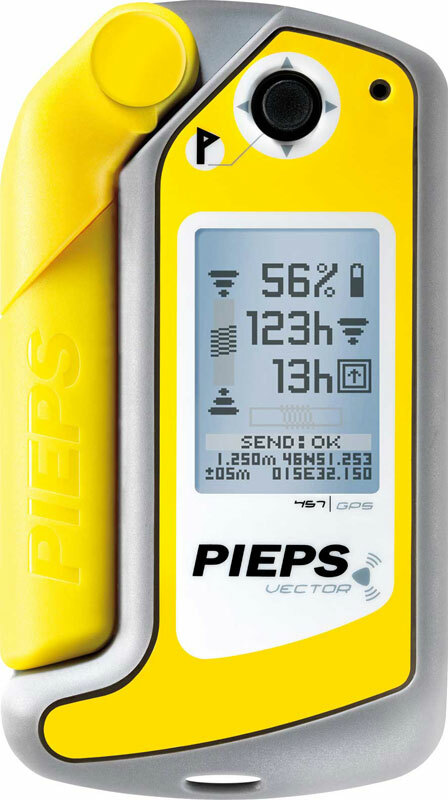 Summary: The Pieps Vector combines a GPS with an avalanche transceiver to create a new class of transceiver. The Vector is proficient at transmitting and searching, and the GPS aids in "suppressing" multiple burials. However, the addition of the GPS and an inconsistent user interface create the most complicated avalanche transceiver ever manufactured. I'm unable to assign the Vector a "Score" to due the dichotomy between the Vector's capabilities and complexity. Searching: During the signal search, the Vector harnesses the GPS to display a blob (i.e., "map mode") which shows where you've searched. It's nifty, but I'm unsure it adds much to the signal search. The "find mode" displays traditional distance and direction indicators. During my testing the direction indicator was a little jumpy and would frequently bypass the incremental directions and jump from pointing straight-ahead to hard-right or hard-left. And although the arrow can point in seven different directions, it seemed to use only five of these regardless of how slowly I rotated the beacon. While searching, the total search time is displayed at the bottom of the screen and a GPS track of your search path is recorded. Multiple Burials: The "find mode" screen-shot shown above indicates that there are three avalanche transceivers (at 30, 40, and 50 meters). The main direction indicator is pointed toward the closest transceiver (at 30 meters). Note that there are also miniature direction indicators (straight lines) next to the three distances. If it works consistently, and it did during my limited testing, this is a vast improvement over displaying a few stick figures to indicate multiple transmitters. If the signals from multiple transmitters overlap, a little "signal overlap" icon appears on the screen. You can "suppress" (aka, "mark") the nearest transmitter by pressing down on the joystick. The main direction indicator will then point to the next closest transceiver and the rectangle containing the suppressed transceiver's distance will darken. When you suppress a transmitter, the GPS also saves a waypoint at that location. This allows the Vector to show the suppressed transceiver in map mode based on the GPS location rather than the transceiver's flux lines. It seems quite accurate. Spikes: The Vector handles spikes much better than a two-antenna transceiver (which cannot handle spikes), but the unit I tested reported the closest distance when over the spikes rather than when over the victim (although the displayed distance only varied by 0.1 meter). I imagine this will be fixed in an update—it should be. Controls: Here's where it gets complicated. The Vector has a power button (which is also used for other tasks, like setting the screen contrast), a scan button (which is also used for other tasks, like toggling between map and find mode), [+] and [-] buttons (which are only used to change between keyboard character sets when entering user information), and a four-position joystick (which can be pressed to select menu commands and to suppress a transmitter). The unit is switched between the transmit, search, and GPS functions by repositioning the fold-out antenna. It's a far cry from the Off/Send/Search simplicity of all the other Pieps transceivers. And the Vector's complexity goes beyond the numerous physical controls. When the unit is turned on, you have to tell it whether you are wearing a Pieps Backup. Without a Backup, most of the traditional GPS features (e.g., navigating to waypoints) are disabled. This makes sense, because the folks at Pieps don't want you to be buried by an avalanche after taking off your rescue beacon to putz with your GPS. That might be a good reason to not combine the functionality of a GPS with an avalanche transceiver in the first place. The main GPS menu displays twelve different icons. Some of them are intuitive (e.g., the wrench), but whatdaya think the descending graph, man-with-hourglass, or the two clock-like icons do? And although the user interface is learnable, it isn't intuitive. Here are a few examples: To zoom in when in map mode, you toggle the joystick downward (versus pressing the [+] key which seems a more intuitive way to zoom in). If you want to cancel the display of a menu, you toggle the joystick upward until the selection goes off the top of the menu (versus toggling left to move "back"). To clear previously suppressed beacons during a multiple burial, you need to press the power button briefly which displays a menu showing the TX 600, frequency check, and Reset commands, and then choose Reset. Even turning the device off presents two confusing shutdown options "Power OFF" and "OFF 24h Standby". The shutdown menu also brings up the "Accu Calibration" option which seems like it might belong in the system setup. While wearing the Vector I heard a beep, removed it from the harness, and saw a message saying that I'd lost the GPS signal (glad I wasn't struck by an avalanche then). When you turn on the power, or change between transmit and search, the device sounds like a Gameboy (or a Tracker3). Comfort: The Vector snaps into a rigid plastic frame. The unit can snap in with the screen facing outward or toward your body, although the pictures in the user's manual show it facing outwards. That's usually a no-no, but I was told the screen is durable and the screen needs to face outward to receive a GPS signal. It's easy to get the Vector out of the frame with gloved hands. Other Features: If you haven't figured it out by now, the Vector is the "everything and the kitchen sink" transceiver. It includes a GPS, an altimeter, compass, and inclinometer, support for the iProbe and the TX600 dog receiver, and a barometer for weather tracking. Another unique feature of the Vector is the use of rechargeable Li-Ion batteries (which are charged via a USB cable). [Note: The batteries apparently caused the Vector to be recalled.] The USB cable is also used to download your waypoints and tracks (which requires that you install a browser plugin and register on Pieps.net) and to update the device. The Vector can display your name and contact information on startup (in case a good Samaritan finds it), and supports firmware upgrades. It incorporates the "smart transmitter" feature that was introduced in the Pieps DSP "Classic" (where the transceiver modifies the cadence of its beeps if another transmitter is nearby). The grammatically weak English user manual explains that the device selects the transmission antenna based on interference from other electronic devices. If you hold your cell phone against the antenna while transmitting, the message "Send:E4(X)" appears (i.e., sending error #4 on the "X" antenna) and the transceiver starts transmitting on the "Y" antenna (this is also graphically displayed on the main screen). I was never able to get the device to switch back to the "X" antenna (even when I held the "Y" antenna against a computer monitor). Unlike the Ortovox 3+, S1+, and Zoom+, the Vector does not select the transmission antenna based on the physical orientation of the transceiver. If you tell the device that you're wearing a Pieps Backup when you turn it on, you can use the GPS to save waypoints and tracks, backtrack, navigate to a waypoint, etc. If you don't tell it you have a Backup (of course, you can always lie), the GPS will only display your "emergency location." The main screen displays the battery percentage, the number of hours the device can transmit, and the number of hours it can search. About the only feature that isn't in the Vector is an earphone jack. I've undoubtedly failed to mention some features, but you get the idea. Upgrades: The Vector can be updated via the supplied USB cable and the internet. That's much more convenient than shipping the device to a service center. Conclusion: After reading the above review, it should be obvious that the Vector isn't for everyone. Pieps recognizes this and told me they envision the Vector being used primarily by professional rescuers. I'm undeniably a gadget-guy (case in point: this website), but I plan to stick with an avalanche transceiver that doesn't include features unrelated to avalanche rescue. I'm unsure the Vector is right for anyone. Cons: Overly ambitious features. Recalled.